It has oft been said that there's both good and evil in everyone. Another way of saying it is that things are never totally black nor totally white, but in reality are a shade of grey. So it's of great interest to me when I get a passenger in my cab who does not appear to have any shade of grey at all but seems, rather, to be either an undiluted evil or an undiluted good. Characters like this really grab your attention. They've been populating newspapers and novels since observations began appearing in print. I've had a few lately, and here is my report. A few weeks ago I worked a Saturday night shift, something I rarely do anymore even though it's the best money night. I'm just sick of the drunks and, of course, Saturday night is "Drunk Night". I'd much prefer to take a sober business person home from work on a Monday or a Tuesday than to have to endure the party people. But I did work this one Saturday shift and it was a reminder of what a truly wild place New York City is on that night of the week. And it provided me with both of these tales from the dark side. 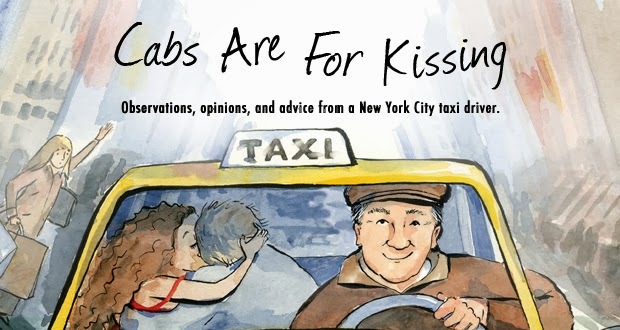 When you drive a cab, especially with passengers who are less than sober, you have an enormous fly-on-the-wall opportunity. There is a definite tendency for people to carry on with each other as if you're not there, and so you have this unique window from which to observe them in an unvarnished state. Some of these people, of course, are married couples. Now, if you are the survivor of a bad marriage, or if you are currently married and are experiencing some turbulence in your own voyage, you may think you know something about what it's like to be in a destructive relationship. Well, let me tell you something, Charlie or Charlotte, I would bet you dimes for dollars that whatever mess you've been involved in would pale in comparison to the two maniacs I had in my cab on this particular Saturday night. They were well-dressed forty-somethings who had emerged from a restaurant on the East Side and, from what I overheard of their conversation - which was their entire conversation - they were coming from a dinner party that had been attended by people who were business associates of the woman. So it was one of those situations where "business" is combined with "pleasure", which is often a recipe for "stress". The man abruptly barked their destination - the Upper West Side - at me as they sat down in the back seat without saying the word "please", an indication in itself that I wasn't viewed as being a person of any importance to them, if, in fact, I was viewed as being a person at all. Lack of manners is something I unfortunately am quite accustomed to, so it slid off my back and I started driving up First Avenue toward 66th Street, the road that goes straight through Central Park to the West Side. Their conversation began with a few back-and-forths about the party in a civil tone. And then the man, who had been walking on a tightrope he wasn't unaware of, made a comment that sent him tumbling toward the pavement far below. He mentioned to his wife that he thought they should have stayed at the party a little longer so she could could chat it up with a particular business associate whom he thought could be a potential ally in some future business scenario. This one statement was all it took to make the volcano explode. She jumped on him like a lion on an antelope. (Or a lioness in this case.) Her facade of civility disappeared completely and was replaced with a hostility that would have rippled even Jack the Ripper. Not only was he completely wrong in his opinion, she roared, it was utterly, deeply, and unforgivably insulting to her that he should imply that she didn't thoroughly know what she was doing at the party. He tried to apologize, but his attempts to placate her only seemed to fuel the fire. Here, she wailed, was yet another attempt to undermine her confidence by someone who was a complete failure in anything he attempted to do. What had he ever done in life? What had he ever accomplished? How dare he suggest that she wasn't adequately skillful in a social situation? Leave the party too soon? All the guests were leaving! Clearly, to try to engage the person he had mentioned in conversation at that time would have been a mistake. You idiot! You idiot! You brainless, thoughtless, trip-over-your-own-shoes idiot! Like an insect that's caught in a spider's web, he continued to try to wiggle free. Well, he replied, he was just saying. It was just a comment. But she would have none of it. Shark-like, she moved in for more. "That was your fatal mistake," she snarled. "I'm cutting you out! You're getting nothing!" I came to understand, as her damnations continued, that she controlled the purse strings in their relationship - she was the one with the money. This conclusion was supported by his complete lack of retaliation to her rantings. Glancing at him in the mirror, he resembled a boxer who had fallen to one knee and was about to receive a salvo of new punches which he realized he was helpless to prevent. "There will be no third child!" she proclaimed. "What do you mean?" he said in a kind of stunned apathy. "I'm getting rid of it," she stated coolly. I noticed a particular perversity in the way she put this forward. There was no sadness or regret in her voice. Rather, there was a hint of the sublime. He was on his back on the canvas and offered no response. The remaining five minutes of the ride took place in an atmosphere in which the tension could not have been cut with a knife. You would have needed a chainsaw to do the job. I thought how funny it would be (to me) if I suddenly broke out into the song, I Get A Kick Out Of You. But of course I kept my mouth shut and just kept driving. After I'd dropped them off, it took me three fares to shake off the effects of the ride. By "three fares" I mean the next three passengers in my cab served as my own personal therapists for downloading on them the emotional strain I'd just been subjected to. Fortunately, they were all good listeners and I felt much better as a result. But I came away with some thoughts. Firstly, just the amazement at how bad it can get. How evil intentions, dishonesty, cowardice, and propitiation feed off each other until both parties are utterly entrapped by their own personality flaws. Secondly, I haven't been able to get the thought out of my mind that someday he's going to murder her. And thirdly, and this is a personal note if you will indulge me, I had the odd realization about a week later that many years ago I had imagined these two people. I wrote a stage play in the early '80s about a married couple who were just like these two. The funny thing is, I'd never actually met anyone like them in real life. I had based my play loosely on the characters in the play Who's Afraid of Virginia Woolf? and figured there must be people like that out there. Which just goes to show that if you drive a cab in New York long enough, everybody eventually shows up - even people who had previously existed only in your mind. Now, it often happens during the course of a shift that you find yourself pulling in the same kind of thing that you'd just gotten rid of in a kind of karmic reverberation. And it happened that night. Just as I had regained my aplomb, I encountered Mr. and Mrs. Insane Number Two in Tribeca. I was driving up Hudson Street at around 1 a.m. looking for my next fare when I was hailed by a young guy who turned out to be a doorman for a small hotel about a block and a half away on Greenwich Street. He had been sent by patrons of the hotel to fetch a cab because Greenwich Street at that hour of the night is relatively deserted whereas Hudson Street is full of taxis en route from lower Manhattan to the passenger-rich Soho and Greenwich Village sections of the city. It's not unusual for a doorman to provide this service. He hails the cab himself as if he were the next passenger and rides in the cab the short distance back to his hotel. Since he is seated in the taxi, the driver instinctively turns the meter on as the trip begins, which is what I did in this instance. We pulled up in front of the hotel and waiting there were a man and a woman who I would say were in their mid-fifties. He was about five-foot-eight with about 70 pounds more than he needed and with a salt and peppered full head of hair, and she stood out in a party dress and a puffed-out top of bright red.The doorman exited the back seat as we pulled up to the place, and held the door open for his patrons. The meter had already clicked once, up to $3.40 from its initial drop of $3.00. But the couple did not enter the cab. Instead, the woman came up to me and asked, in an accent heavy with a lifetime in Brooklyn, if I knew any good diners. "Do you know one close to here?" "Yeah, we could go to Greenwich Village. I know a couple of coffee shops there." "Do they have fried clams?" "They probably do. They all do." "What about shrimps?" And then, without waiting for an answer, she turned to the man. "Honey, I can't decide if I want clams or shrimps." He looked at her with an expression on his face that seemed to say that he was the godfather to women who can't decide between clams or shrimps and that all would be well for her if she just continued never to have an intelligent thought of her own. In short, he was the sugar daddy in this relationship, she was Daddy's little girl. This was apparent to me just from this quick exchange. "Ewwww," she whined, little-girl-like, "what should we do?" He murmured something to her I could not hear, and then they did a remarkable thing - they started to walk away. The doorman and I simultaneously glanced at each other with puzzled looks on our faces. I told him there was now $3.80 on the meter, and that I was owed this, which he understood. Although he was just a kid and had been put in an awkward situation, he nevertheless summoned up his courage and approached the man, telling him the meter had been started when he'd gotten the cab. The man just looked at him as if he was a bug, gave him a sarcastic little laugh, and continued walking away with his parasite. Now, this may not seem like such a big deal. One could say it was just two rude people being rude. But let me tell you something - in thirty-one years of taxi-driving, with probably a couple of hundred doormen getting in my cab as this one had, this had never happened before. It was a first. And firsts are rare after all these years, so it made me examine the incident carefully in my mind. Certainly no huge incident of destruction had occurred. There had been no violence nor bizarre dramatization as had happened earlier in the evening. But still this little episode really stuck in my craw. I asked myself, who would do something like this? Have a doorman walk a block to get a cab, then not take the cab he'd gotten without a "sorry" or an offer to pay what was on the meter? And then just walk away with a sinister laugh? I couldn't imagine myself nor anyone I know ever doing such a thing under any circumstances. What sequence of events would it have taken to have acquired an attitude like that? I concluded that it would take someone who was utterly at ease with committing harmful acts upon others. Someone who was a professional at it. Someone who, if he ever thought about it at all, would consider the idea of other people having rights as just an ememy's attempt to stop him from getting what he wants. Someone who, at his core, was evil. And when I say "evil" I mean the continuous intention to do harm to others when there is no need to do harm to others. So it wasn't what he'd done to me and the doorman that had stopped me in my tracks. It was my perception that this was a person who was capable of an enormous quantity of evil. And the only context I have for such a person are the movies and television dramas I've seen about the Mob, particularly Goodfellas and The Sopranos. The characters in these shows are portrayed as having just these kinds of anti-social traits, and this guy, both in his actions and appearance, fit right into that odd slot. So I said to the doorman something that I thought might add to his education, or at least make the incident permanently memorable for him. "That guy's in the Mob," I said. And I drove off looking for my next therapist. I mean, passenger. Several months ago, in the dead of winter, I picked up a middle-aged woman at 3 a.m. in Midtown who was en route to her apartment in lower Manhattan but wanted to make a stop on 23rd Street between 5th and 6th Avenues. It turned out she was a lawyer. Now, I am as cynical as the next person about lawyers but this one was of a different mold, if in fact there is a mold at all. The first thing I noticed about her was that her manners were totally "in". I said "hello" to her as she entered my cab, as I do with everyone. She said "hello" back. She told me her destination and asked me if it would be okay with me if we made a stop. I told her that of course that would be no problem and I noted the fact that she had asked me this even though she didn't have to. So here was a person who just by her nature was considerate of the feelings and the rights of others. In short, a "social personality". Not surprisingly, she was an easy converstionalist and I soon learned why she wanted to make a stop in the middle of the night. There was a church on that block, she said, which shelters homeless people. This particular church was not licensed by the city to be a homeless shelter, but did what it could, anyway. (She told me something I didn't know, which was that if a shelter isn't so licensed they cannot provide beds to people. So what this church did was provide chairs to people so they could attempt to sleep in a sitting position in a place where at least it was warm.) The reason she was making a stop here was to deliver paperwork she had been preparing to benefit one of the homeless people in the church, a woman from the suburbs of Connecticut who had lost her job and had subsequently lost her home. The paperwork had to do with red tape hurdles that needed to be cleared in order to situate this woman in affordable housing. We continued the ride to her apartment building in Tribeca, a nice building in a nice part of town. I learned that in these tough economic times there were more and more people who are truly "homeless" - people who have literally lost their homes and have at least temporarily no place to live, as opposed to people who are also classified as "homeless" who are actually substance abuse cases or outright hustlers. I also learned that she does this legal work pro bono (for free) as a matter of conscience. At the end of the ride she thanked me again for making a stop in the middle of the ride, as if I had done something extraordinary. She paid me the fare and gave me a way-above-average tip, which I accepted but later felt a little guilty about for having done so. And I realized as I drove away that this was a person who was also looking out for me. She showed kindness and concern when she didn't have to, traits that came naturally from within. I perceived no grey here. She was all good. Then, a few weeks ago, I had a fare who was almost a duplicate of this woman in character and deed. I picked her up on the Upper West Side near Riverside Drive a bit after midnight. She needed to place several large boxes in the trunk of the taxi, which I helped her to do. Her destination was a city-run shelter on 108th Street in Harlem and, like the previous ride, she asked me if I would be willing to wait for her while she made a delivery and then bring her to her own apartment building on 97th Street. I noticed the smell of salami as I loaded one of the boxes into the trunk, and this was a clue as to what she was doing. She told me that she regularly takes excess food from a school to this shelter. She does it out of conscience, I surmised, out of feeling a need to take some responsibility for the welfare of others less fortunate than herself. And, like her predecessor, her kind nature wasn't limited to an exclusive charity, but included me. Aside from a friendly conversation and providing me with an example I could write about, she also gave me an exorbitantly high tip. Which I also accepted but again felt a little guilty about, thinking this was a person to whom I really should be offering a free ride. In looking back at these four fares, I believe the entire human condition on the broadest of scales could be demonstrated by them. I believe most people are basically good, but are hindered by forces internally and externally that they have difficulty controlling. And I believe a small percentage of people are actively, continuously perpetuating harm. And thus the story line of the human race is the same one you see in movies all the time, good versus evil. Why this is so and what should be done about it are the subjects of philosophies, psychologies, and religions. I would not attempt to try to explain it. I would say, though, that as a member of the grey team, I am grateful for the angels among us. And grateful to you as well if you think it might be a good thing to click here for Pictures From A Taxi. I am glad you didn't break into a Sontime song. You would have been eaten. Yeah I've been to those shelters and they are no fun. True very to life stories of New York...supercool as usual G.S. Great stories which always make me eager for more. I truly want to believe that evil people do suffer eventually. You're an excellent writer as well as a fabulous photographer. I hope you've been published in both capacities; the banality of our modern times would benefit greatly by your visions and observations (in every sense of those words). Yes, we are surrounded by angels and demons; unfortunately, it isn't always easy to spot them -- and we confuse them at our peril. I plan on following both your blogs; you're a talented and interesting man. Oooh. I wonder what happened to the first couple. And the possible baby. It would have been worth it to break out in song just to get the womans reaction!